Sometimes it is more fun to stay in with your sweatpants and take out Chinese food than to head out to the theater for a fun movie night. Planning a themed movie night or marathon is a great way to hang out and relax with friends or family. 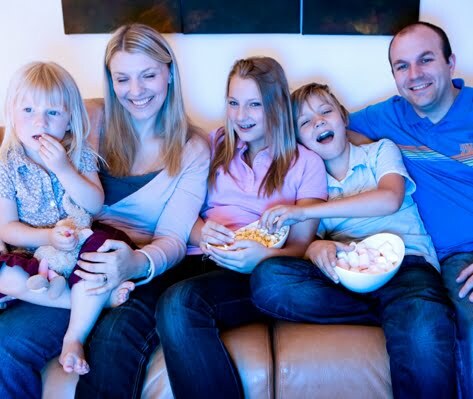 Here are some tips for fantastic movie night success. Start by deciding what you want to watch. Maybe it’s a Lord of the Rings marathon. Or perhaps you want to enjoy an entire season of your favorite TV show. Another option is to pick a beloved actor or director and choose a few of his or her films. Or select out a time period or genre like movies about Paris or 50s musicals. Once you’ve settled on what to watch, the theme should be easy to decide on. Choose the location of the film as inspiration. If you are getting together to watch Oklahoma! then you can go with a wild west theme, complete with cowboy boots. Or just use the series itself for decorations and ideas. For a Once Upon a Time season marathon, you can play on the important items like apples for décor ideas. Before your guests arrive, make sure you have set up the surround sound technology and all your electronics are ready to go. Also set out the films so that you know you have all the discs and won’t be running around frantically trying to find the next installment of Harry Potter. Make sure you’re prepared with awesome snacks and other good eats to sustain your living room audience. There are fun recipes for fancy popcorn. Set up a candy bar with favorite munchies like Mike ‘n Ikes and Hot Tamales. It may also be a good idea to provide a few veggies along with the chips and dip to help your audience feel better after 13 hours of Star Wars. If your guests are going to be there for several hours, then it is probably a good idea to have a real meal break at some point. This can be a good opportunity to get up, stretch legs and rest eyes while cooking homemade pizzas or tossing a salad. Or you can have something prepared ahead of time so that eating doesn’t have to interrupt the movie. The advantage of a home movie night is that you are free to sprawl out over the entire living room instead of sitting upright in a theater seat. But make sure that your living area is tidy and clean so that guests can feel comfortable stretching out on the floor or lounging on the couch during the film. Provide plenty of blankets and pillows, as well. Another exciting option is to take movie night outside. With a projector and some lawn furniture, you can set up an inviting outdoor theater. You can set up a fun ambiance just by moving things to the backyard or patio. With these tips for organizing the greatest movie night ever, you can enjoy quality time with family and friends. Weekend are the best days for planning a movie especially saturdays… Friends and family get togethereand enjoy . What is more happier than all together at same place and enjoying a movie.. I would much rather watch a movie at home then the theater. The cost of the theater and the rudeness of most people just ruin it for me. I can wait a few months to see most movies. I love watching movies at home with my family. The real excitement is when you’re with your love ones. Thanks for this wonderful post!